It’s 2040, and the human base on Mars is bustling. Robots are moving about, carrying out exploratory missions operated from the base. At a safe distance from the human habitat, powered by a nuclear reactor shipped from Earth, rockets are taking off and landing. Machines are mining water and oxygen. Somewhere in the hab, farmers are tending crops. Geologists swarm over cliffs and outcroppings with rock hammers. That was the picture painted at a conference Saturday hosted by Arizona State University for teachers on how to prepare students for the push to land humans on Mars. Some of the world’s top experts on space travel and the Red Planet discussed what the experience will be like, what we need to know and what problems need to be cracked so the voyage can happen. Phil Christensen, Regents Professor and the Ed and Helen Korrick Professor in ASU's School of Earth and Space Exploration, has built five science instruments that have flown on NASA missions to Mars and two that are slated to go to an asteroid and a moon circling Jupiter. He discussed the big questions that can only be answered by boots on Mars and some of the spectacular sights astronauts will see. Richard Davis is the assistant director for science and exploration in the Science Mission Directorate at NASA. He is also the co-lead for the Mars Human Landing Sites Study and the former capsule communicator, or CAPCOM, between Mission Control and the International Space Station. Davis presented an overview of what needs to be accomplished to go to Mars and some of the work that’s being done already. “It’s fun to talk about Mars, but the answer to most questions is ‘I don’t know,’ ” Christensen said. We don’t know how much water there is on Mars, or where it came from. We don’t know how old the surfaces are, what the history of the climate is or the biggie: Is there life on the Red Planet? If not, why? Everything necessary for life has existed on Mars. Once humans do settle on the planet, there will be both majestic experiences and surmountable obstacles. 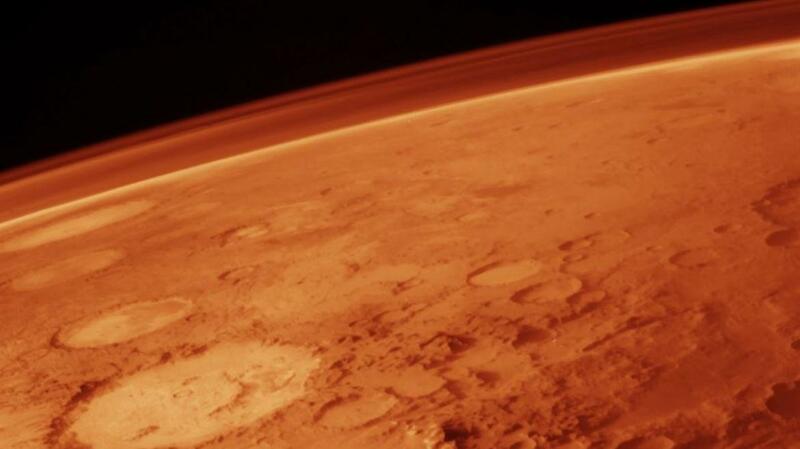 Mars is home to the solar system’s biggest volcano and largest canyon. Standing on the edge of the latter is going to be a treat, Christensen said. “We love our Grand Canyon, but this thing is big,” he said. Valles Marineris is 25,000 feet deep in places and about 2,500 miles long. Martian dust is going to get into everything. “When humans go to Mars, that’s going to be their biggest problem: Dust is everywhere,” Christensen said. Davis said NASA aims to put people on Mars in the 2030s. He gave an overview of the Mars Human Landing Sites Study. Mars ascent vehicles will be sent ahead. And the landing zones will have to be far from habitable zones because of rocket blasts. Exploration zones need to have interesting scientific areas nearby to examine. There need to be material resources nearby, to extract water and oxygen. A base will include a small fission reactor for power. Davis compared a Mars base to McMurdo Station in Antarctica, which began as a collection of huts and is now a base so big it requires urban planning. “We are viewing this as a semi-permanent base,” he said. Martian soil is toxic; it will have to be cleaned and mixed with organic material to produce crops. It’s more than a food issue. David said the psychological effect of seeing “living green things is massive” in space. When the Russians load supplies for the space station, they put the fresh produce in last so it’s the first thing astronauts see — and smell — when they open the capsule, he said. It’s a huge morale booster. Davis went through a laundry list of what problems need to be solved for a human Mars push. • NASA is developing equipment (like toilets) on the International Space Station that won’t break as much as their current versions because resupply won’t be an option on a Mars mission. • “Current space suits are a pain,” Davis said. Prepping a space suit for a space walk nowadays takes about a month. • With almost no atmosphere on Mars, slowing down enough to land people safely is a problem to be cracked. “Having a system that’s reliable that can land there is crucial,” he said. • An aerial capability to explore the planet and bring back samples will need to be created. NASA doesn’t have anywhere near the number of people who will be needed to accomplish a Mars journey. It’s going to be an international effort.